Rose leaves decorate the edges of this scarf end pattern, and an oval medallion in the center makes it unique. 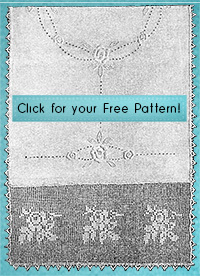 You can use this pattern to beautify the end of a table runner or dresser scarf, or leave the top oval oﬀ for a pretty valance. Designed in 1925 by Olive F. Ashcroft, it is very unusual and eﬀective.